My latest recipe – Sweet and Salty Cookie Bars – is now available in Pink Magazine SK. Why choose between salty & sweet when you can have both in one delicious treat! 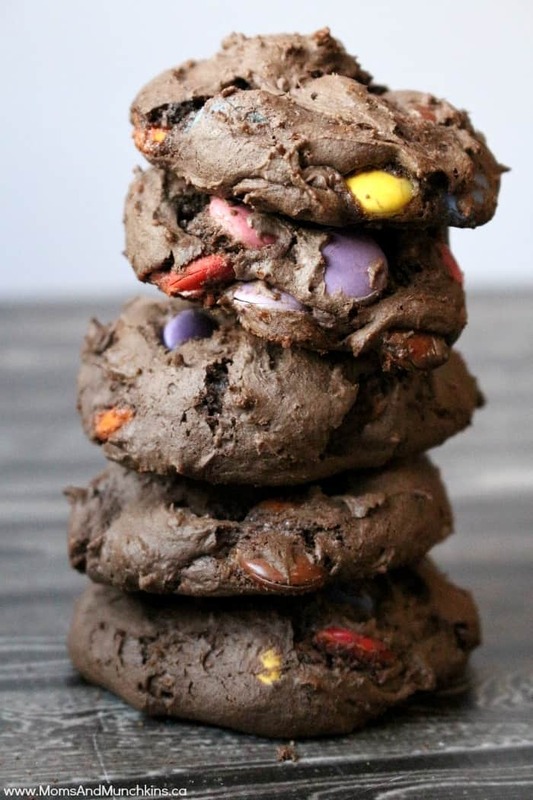 This recipe is incredibly easy to make and you can add in any kind of chocolate candies or bars you like. I chose nut-free sweets like mini Rolos, Smarties (or other candy-coated chocolates like M&Ms), Hershey’s milk chocolate chips, Aero bars and Rold Gold Pretzels. 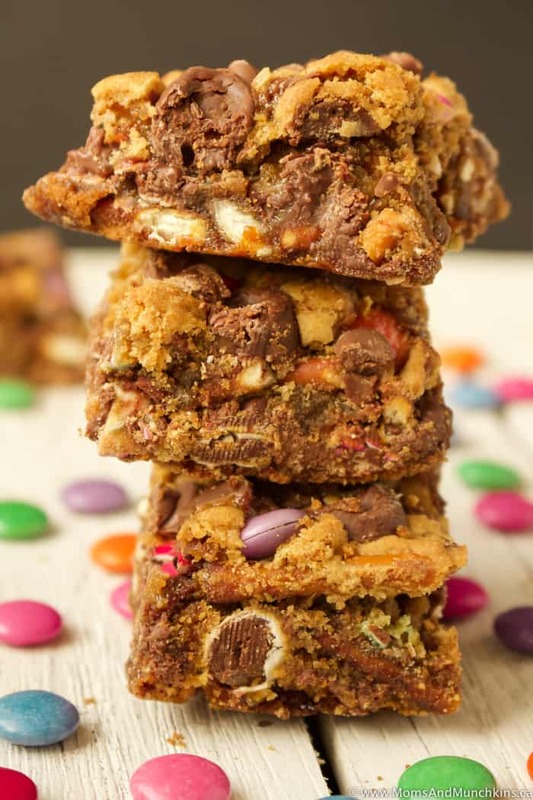 I bet a chocolate coconut candy bar would taste great in these cookie bars! 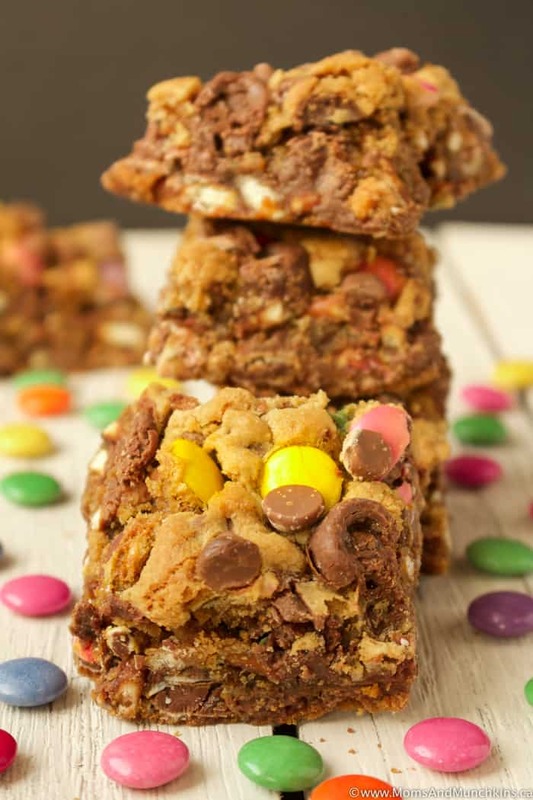 This is a great dessert to serve at a child’s birthday party or you could use up some of the leftover Halloween chocolate to make these sweet treats for holiday baking. 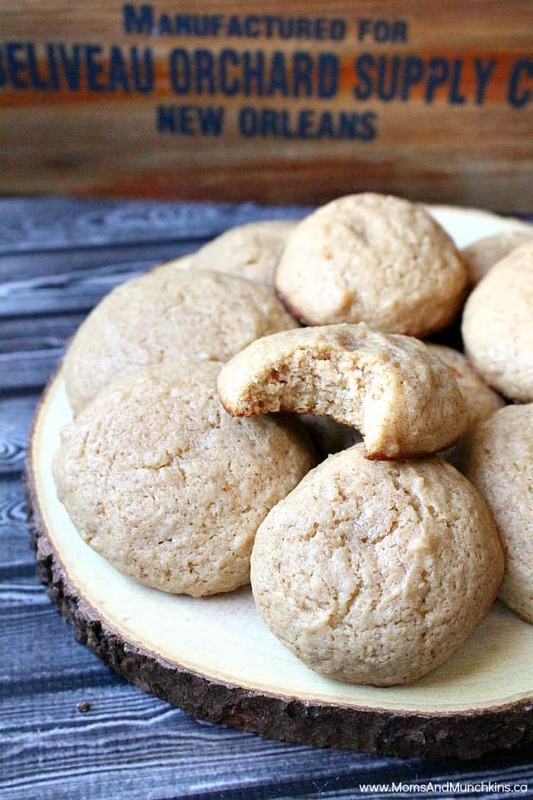 These would be a delicious idea for a holiday bake exchange. 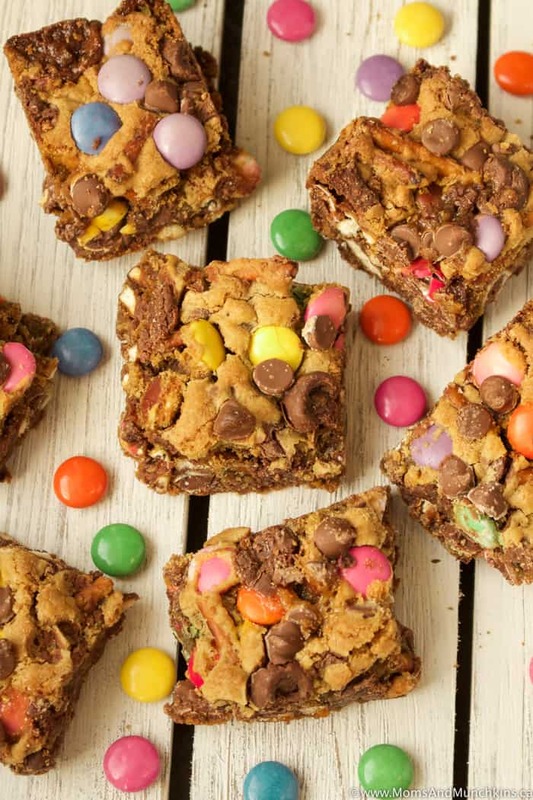 I served these cookie bars at a holiday party and they were a hit with both the kids and adults. Line an 8"x8" baking pan with parchment paper. In a large bowl, beat butter and brown sugar together on medium speed until well combined. Pour in all of the pretzels, ¾ cup of the candy-coated chocolates, ¾ cup of the mini Rolos and ¾ cup of the milk chocolate chips. Stir well to mix. Pour batter into prepared baking pan and smooth it out so it's spread evenly in the pan. Sprinkle the remaining ¼ cups of candy-coated chocolates, Rolos and milk chocolate chips over the top. Visit our recipe page for even more sweet treat ideas. 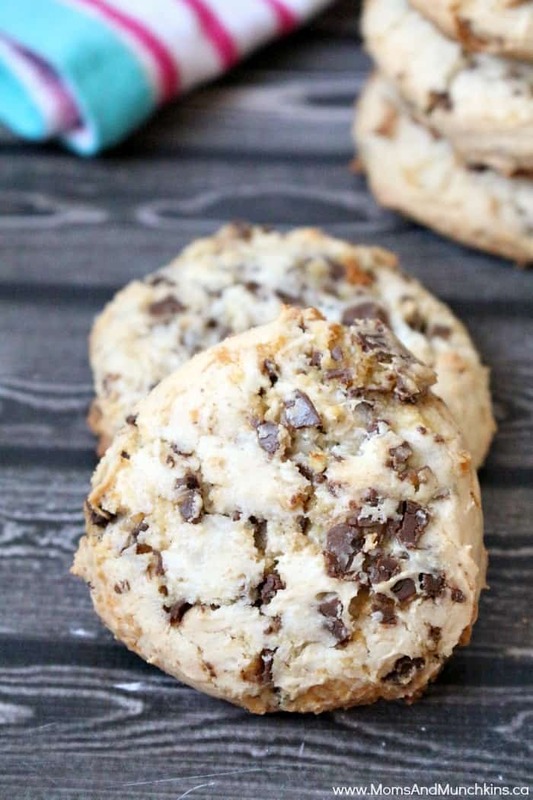 If you’re looking for delicious after-school cookies, I’d recommend these Applesauce Cookies, these Chocolate Coconut Cookies or these Chocolate Candy Bar Cookies. We’re always adding new recipes & party ideas. Stay updated on the latest by following us on Facebook, Twitter, Pinterest and Instagram.